Presenting a Zakk Wylde Original! There's no question that Zakk Wylde is a one-of-a-kind performer and guitarist. As a solo artist, former lead guitarist for Rock and Roll Hall of Famer Ozzy Osbourne, and leader of Black Label Society, Zakk has torched many a stage with his unique style and has inspired thousands of fans to learn to play guitar. A winner of multiple "Most Valuable Guitarist" awards in the metal genre, Zakk combines pure speed shredding with the use of pinch harmonics and chickin' pickin' to create a wall of sound that's second-to-none. And like Zakk, our new limited edition Epiphone Graveyard Disciple will also set fire to any stage in its path. You may have already caught a glimpse on YouTube of Zakk performing live on the classic "Peddle to the Metal" tour and seen Graveyard Disciple in action on stage. Designed by Zakk in cooperation with Epiphone, the Graveyard Disciple combines killer sound with equally killer looks. Shaped like a coffin, the edges of the body are tapered and "pin-striped" in silver giving the Graveyard Disciple a striking visual appearance and depth. As with every Epiphone, the Graveyard Disciple featuress Epiphone's Limited Lifetime warranty backed by world famous 24/7/365 day Gibson Customer Service. Plug it in and wake the dead today! While looks are important, the new Graveyard Disciple doesn't compromise in the performance department either. As with most all Zakk's guitars, the neck is made of hard maple for bright attack and glued into a solid mahogany body which adds a touch of warmth and, of course, sustain. The SlimTaper™ "D" profile neck has a smooth, satin finish for fast and effortless lead work. Top it off with a bound, ebony fingerboard and medium-jumbo frets with easy access to all 22 frets, and you've got a real performance guitar that's dying to be played. The Graveyard Disciple combines an original Floyd Rose™ tremelo with EMG HZ pickups that are perfect for hard rock and metal. The tremelo cavity allows for serious dive bombing as well as pull-ups. 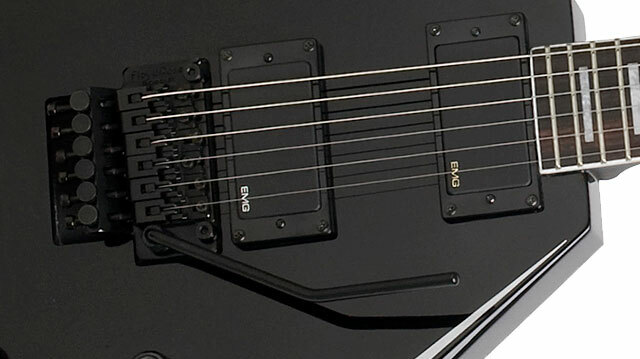 The EMG HZ-4A positioned at the bridge is optimized for leads while the EMG HZ-4 is voiced for the neck position. Designed to emulate the sound of their active counterparts (the EMG 81 and 85), these HZ's are probably the quietest passive pickups available. And unlike actives, you never have to worry about these pickups showing up dead. 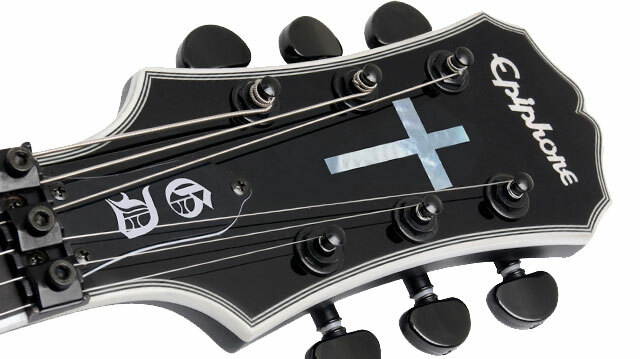 Other features on the new Graveyard Disciple include a multi-bound headstock with pearloid "cross" inlay, black hardware with premium 16:1 ratio Grover® machine heads, pearloid topped metal knobs, Epiphone's non-rotating output jack, and Zakk's signature silhouette on the back of the headstock. 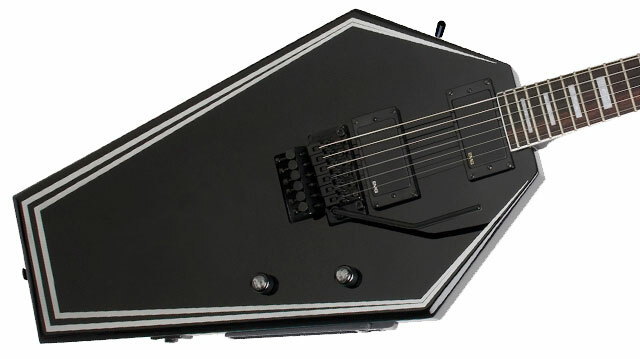 For added comfort and convenience while playing in the seated position, the guitar features the brilliantly designed and patented Steinberger LegRest®. Fold it down and rest it on your leg. Fold it up, and it practically disappears. 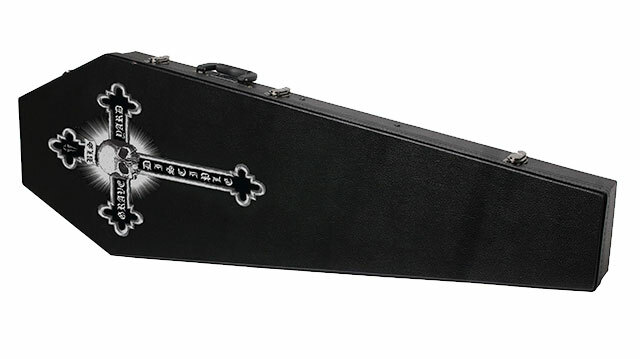 A guitar like this needs to get to a gig in style and so the Graveyard Disciple comes with a custom-made Coffin™ case featuring the "Graveyard Disciple" artwork. And this limited edition model also comes with our Certificate of Authenticity.